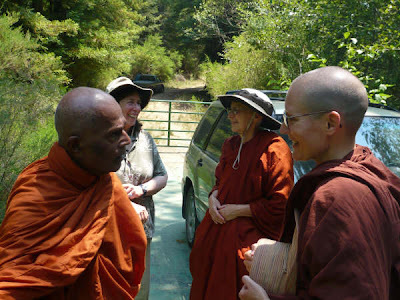 On July 10, 2008 we welcomed elder master Bhante H Gunaratana Sangha Nayaka Thera (Bhante G), the venerable Ajahn Pasanno Bhikkhu, Ayya Tathaaloka Bhikkhuni, Samaneri Sister Suvijjana and the Dhammadharini Board of Directors to the land to see what was then still known as the proposed hermitage site. 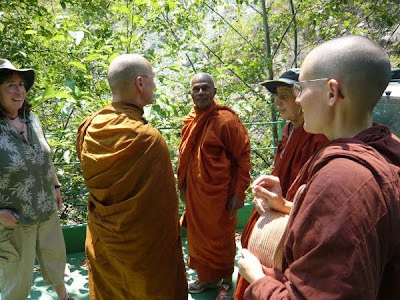 We all felt greatly honored, delighted and blessed by their visit, as both Bhante G and Ajahn Pasanno have probably the most extensive experience with Buddhist forest monasteries and hermitages both in North America and in their original context in Asia as just about anyone alive. 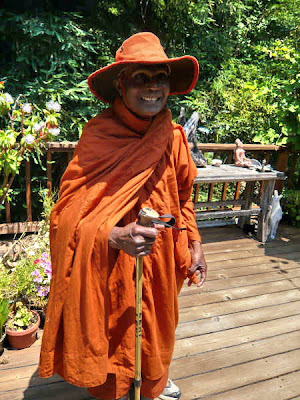 Bhante G is the founding Abbot of the Bhavana Society Forest Monastery in the Appalachian Mountains of West Virginia and Ajahn Pasanno previous Abbot of Wat Pah Nanachat (the International Forest Monastery in North-eastern Thailand) and current Co-Abbot of Abhayagiri Forest Monastery in nearby Mendicino County. Both have been respected as teachers/mentors/advisors by Ayya Tathaaloka and her Dhammadharini Board members for many years. 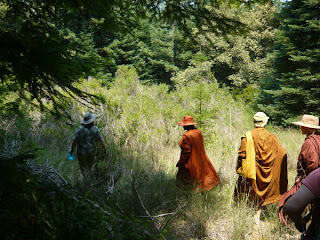 After Jill's gracious offering of the late morning almsmeal to all of the visiting monastics, we set out to take a good look at the land. 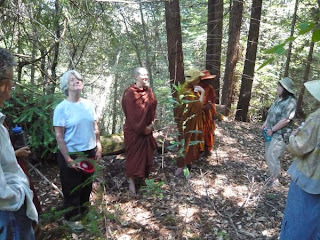 We passed first through the area that is used for the vipassana meditation and women's mindfulness in nature camps, then across the creek, up the steep hill to the saddle between the mountains and across the ridge on Dhammagiri to the old logging access road. 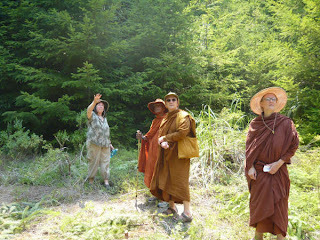 We then came down the road to the first and the second of the two old logging landings and then, passing many beautiful secluded potential platform or kuti sites, hiked the trail down the mountainslope to what friends have begun calling the "bhikkhuni beach" . 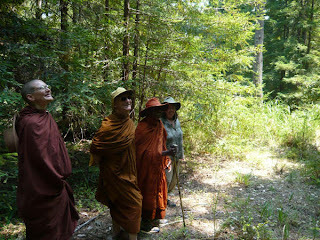 All along the walk both Bhante G and Ajahn Pasanno shared invaluable reflections, insights and advice from their many years experience. 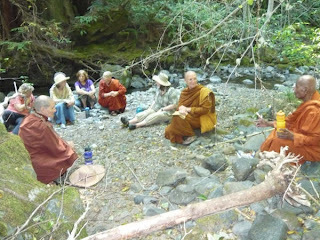 We learned much about trailers, propane, "off the grid", solar and wind, satellite phones, yurts, kutis and platforms, and especially about the Pelton Wheel micro-hydro technology, which, with such a strong year-round water flow and steep slope could provide any and all electrical needs for the hermitage. 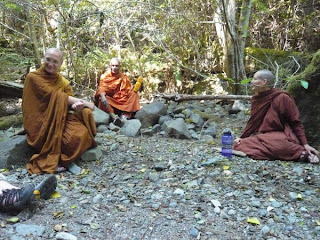 All in all the two Mahatheras seemed to think that it was an excellent site with fine potential and left us with their blessings. An excellent visit. on the bridge crossing the creek.